Amsterdam Cribs B&B is a smokers getaway in the center of Amsterdam. Our place is geared towards people looking to explore the city at a laid back pace. On arrival we give you all the info and ins and outs of the city, making sure your stay in Amsterdam is one you won't forget! We are located in the heart of all the action....Amsterdam Cribs is your home away from home!!! All our rooms are private and equipped with cable TV, mini-fridge, and a shower/toilet. 4 person reservations stay in a room in our fully furnished apartment with kitchenette usage in 7B. Sorry, there is no kitchen use for 2 person room reservations in 7A. We are located in the heart of Amsterdam, just five minutes walk from the Dam Square, Royal Palace, and the Red Light District. The Cribs has a narrow and winding stairway, which may be challenging for some people. We adhere to the Amsterdam B&B regulations of 4 person Max. per address/night!!! All rooms are private!! We do not have dorms or sharing rooms, you must book the entire room!!! * Your reservation must have the correct Arrival time in order to be checked in!!! Guests must inform us of any changes in their travel plans at least 48hrs. in advance! Please provide your phone number!!! * The form of payment is cash upon check-in (no credit cards)!!! * There is a 5 night minimum stay over the New Year's Period. From the Amsterdam Central Train Station take Damrak for 5 minutes to the Dam Square. At the Dam Square turn left on to Damstraat and walk over two canal bridges till you reach Oude Hoogstraat. 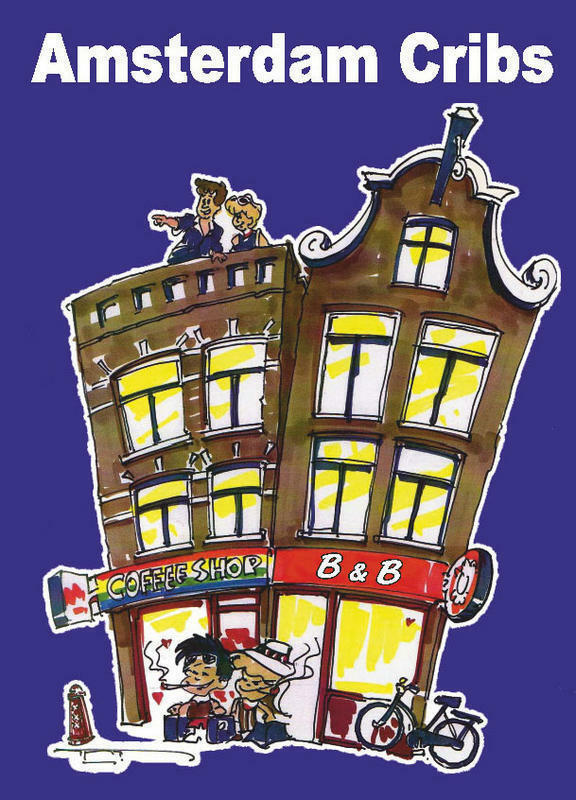 We are located at #7 Oude Hoogstraat, next to the 'Pick up the Pieces Coffeeshop'.